Poovarasankuppam Lakshmi Narasimhaswamy Temple is located in Tamil Nadu, Villupuram. This temple is referred as Dakshina Ahobillam. After killing the demon Hiranya Kashipu, the Lord appeared here for the first time in the same form and show darshanam to the Sapta Rishis as Lakshmi Narasimha, and hence this temple is referred as Dakshina Ahobillam. In this temple, the deity (Moolavar) is in the sitting position facing east, with Amritha Valli Thaayar on the lap. It is considered very auspicious and effective to visit the three Lakshmi Narasimha temples – Parikkal, Poovarasan Kuppam and Singiri kudi, that are in one line near Villupuram, in one day to get the best benefits. A unique feature at this temple is the posture of Lakshmi. One eye of the Goddess is turned towards the Lord and the other eye is welcoming the devotees. Also, interestingly Lakshmi and Narasimha are seen at the same height at this temple!!! There are culverts inside this temple dating back to the 3rd Century AD. Also, there are references to construction during Narasimha Pallava’s reign (7th Century AD). There are also inscriptions indicating Krishna Deva Raya’s visit to this temple (about 500 years ago). This is one of the 8 temples in Tamil Nadu, where Lord Narasimha provided darshan after the killing of Hiranya. The other 7 are Singarakudi near Pondicherry/Cuddalore, Anthili near Thiru Kovilur, Parikkal near Kedilam, Sholingur, Nammakkal, Singaraperumal Koil near Chengalpet and Sinthalavadi. Why and how to pray at Poovarassankuppam Lakshmi Narasimhaswamy Temple - It is believed that all wishes of the devotees are to be fulfilled if one visits this temple, lights a ghee lamp and recites the Mantra Raja Patha Stotram twice a day for 48 days. One should tie a 5 rupee coin to a Manjal cloth and drop it at the temple, once the 48 day period is over. During this period, the devotee should abstain from eating non veg. Swathi Nakshatram on each month and it is believed that visiting this temple on this day is very auspicious. Sudarshana and Dhanvantri homams are performed on this day. Navrathri Utsavam - for 9 days.Sri Suthra Homam is performed. Narasimha Jayanthi Utsavam and 3rd Saturday of Puratasai are also special occasions at this temple. 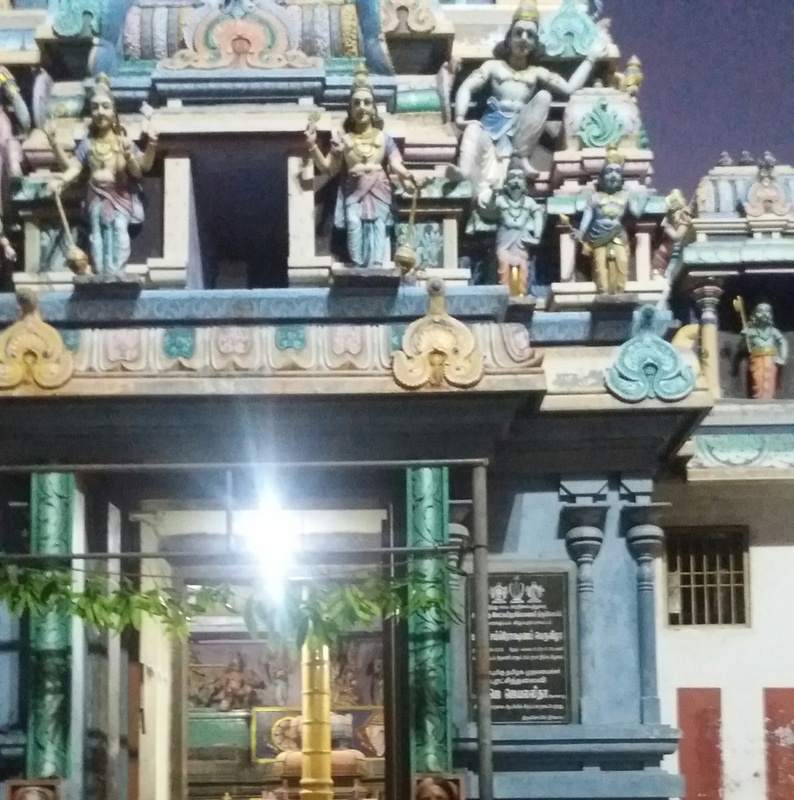 How did the temple get the name as Poovarasankuppam Lakshmi Narasimhaswamy Temple? One of the kings of the Pallava dynasty embraced Jainism and started destroying Vishnu and Shiva temples. People were enraged at this act and protested against the demolition of temples. The king imprisoned those who protested against him. ‘Narahari’, a sage who was horrified at the act, spearheaded the movement against the king and was sentenced to death. Furious at the punishment imposed on him, the sage cursed the king with ‘Brahma hathi dosham’. At this juncture, the king was besieged with problems and difficulties. Finally, he repented for his sins and wanted to get rid of the curse by seeking the blessings of the sage. He went in search of Narahari. While taking a nap beneath a ‘poovarasan tree’, the Lord appeared in his dream and declared that he would be redeemed of his curse as the sage would come there to bless him. When he awoke he couldn't God, instead a leaf from the poovarasan tree dropped on him. The king saw an image of Lord Lakshmi Narasimha on the leaf. His happiness knew no bounds when the sage appeared in person to bless him. The king was absolved of the curse. As per the wishes of the sage, the king constructed a temple for the Lord at Poovarasan Kuppam. Narahari stayed there and propitiated the Lord. By Road - Direct buses are available from Villupuram. If one can visit all the three Lakshmi Narasimhaswamy temples - Parikkal, Poovarasankuppam and Singrikudi - in one day, it is said to be very good and auspicious for the devotee.